NIT Agartala: Why to Join It and Why to Avoid It? NIT Agartala offers a comprehensive academic structure in a lush green campus spread over 500 acres. National Institute of Technology, Agartala or NITA was established in 1962 and was ranked 23rd of all NITs. It is ranked among the top engineering colleges of India. Most popular branches in NIT Agartala are Electrical Engineering and Electronics and Communication Engineering. JEE Main 2013 cutoff rank for EE at NITA was #44459. The placement scenario for NIA has been consistently good. The package deal offered range between 5.00 laksh per annum till 36 lakhs per annum in 2013. 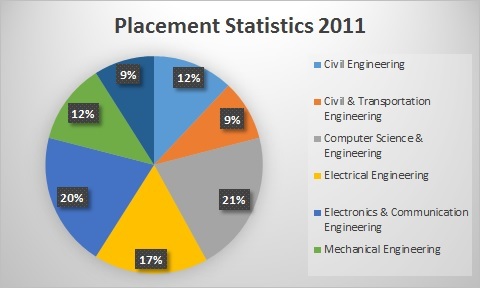 The graph below shows the placement statistics for 2011. The top recruiters were Google, NTPC, PowerGrid, Spaient Nitro, Tata, ITC Limited, Polaris, Vedanta, Sterlite, Alstom to name a few. There are about 100 faculty members at NIT Agartala. Almost all the departments at NIT Agartala are handled by experienced faculties. However, since the location of the institute is a little away from central India, it is difficult to hire and retain the best faculty. Known for very good hostels and excellent mess facilities, campus life at NIT Agartala provides education in a serene environment. Separate hostels for boys and girls are provided. There is a 1042 bed boys hostel and 412 bed girls hostel. All hostels are well-built and maintained with a high level of security and cleanliness. The campus is equipped with high Internet speed and Wi-Fi facilities. Students find ample of time to engage in various clubs, sports activities and societies. There are also annual fest that add to the excitement and fun. Aayam is the techno management fest of NITA celebrates the exuberance of North-East. Moksha is a three day fest that endeavors to brings cultures from all across India on one platform.